As teachers settle into a new school year, it seems a good time to provide some general tips and suggestions on how to make use of popular movies or television in the science classroom. Some of these ideas may be more appropriate for the high school setting, but I hope elementary and middle school teachers will also find some useful suggestions. I will use examples from Monsters vs. Aliens, which comes out on DVD today, September 29, to illustrate each suggestion. Monsters vs. Aliens tells the story of Susan Murphy’s transformation from normal woman into Ginormica, a 15-meter tall, white-haired version of herself. Susan’s transformation was caused by being struck by a meteorite on her wedding day. (I really appreciate that the writers got that right: the object that hit Susan is a “meteorite,” since it reached the ground. While still in space, rocky objects like this are “meteoroids” and while in the atmosphere are “meteors.”) She is captured by the military and taken to a secret facility where she meets several other monsters based on 1950s science-fiction films. There is Bob, a blue gelatinous mass, à la The Blob (1958); The Missing Link, who bears a striking resemblance to The Creature from the Black Lagoon (1954); Insectasaurus, who is a giant mutated larva not so different from Mothra (1961); and, finally, Dr. Cockroach Ph.D., who is the result of a teleportation experiment gone wrong, as in The Fly (1958). First, and probably my favorite way to use movies in class, is to have students collect some data from a short segment and use that data in a quick calculation. Actual data collection in this film is hard to come by, but it is possible to estimate the kinetic energy of the meteorite that hits Susan at the start. Students can estimate the size of the meteorite if you pause the film just before the collision, and you could even get a rough speed number by advancing frame by frame. Combine the estimated volume with a density of about 3 grams per cubic centimeter, and you have the approximate mass of the meteorite. Then the kinetic energy is ½ mv^2, and can be compared to the energy of a soccer ball or moving car. As a check on students’ ability to apply a science concept in a new context, you might show a short scene from a film and ask students to “spot the errors.” For this application, the film you use depends on the topic you want to review, and Monsters vs. Aliens is especially good to check on students understanding of scale. A classic way to make a movie monster is to put an actor wearing a rubber suit in a model city. He stomps around knocking down buildings and power lines until confronted by another actor in a different suit who stops him. The problem is that simply scaling up an animal does not work for a variety of physical and physiological reasons. First, consider the volume (and if the density is maintained, also the mass) when an object is doubled in size. If you take a cube 1 cm on a side and double all the dimensions, you get a cube 2 cm on each side, with a volume of 2×2×2=8 cubic centimeters. That means doubling the size of the cube made it 8 times more massive (23=8). Susan/Ginormica went from being a normal height (say 1.7 meters) to approximately 15 meters tall. That’s a factor of about 9, so her mass would increase by a factor of 93 or about 730. Her mass would go from a very reasonable 60 kilograms to over 43,000 kilograms. This might not seem so bad, since she has larger bones and muscles as well. The problem is that the strength of a bone is determined by its cross section, not its volume. When she grew by a factor of 9 in all directions, the cross section of her bones grew by a factor of 81 (9×9). While Ginormica’s mass has gotten more than 700 times larger, her bones have only gotten 80 times stronger, and her skeleton would collapse. 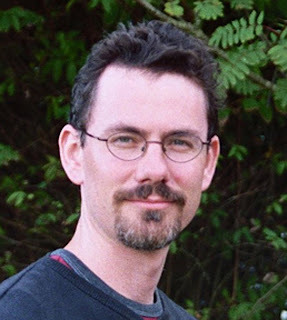 For a more complete treatment of the biology of science fiction movies, check out Michael LaBarbera’s article at http://fathom.lib.uchicago.edu/2/21701757/. Finally, you can use films to initiate a class discussion of how science is perceived by the public. 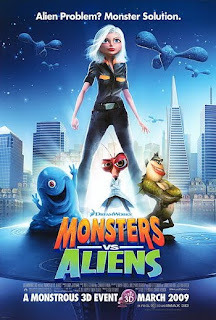 Monsters vs. Aliens perpetuates a stereotype of the “Mad Scientist” common in science fiction and the media generally. (Try an image search on the Internet for “scientist” and see how many of them show a man in a lab coat with wild eyes and crazy hair.) As a follow up to the discussion you might invite a real scientist to your classroom for a visit, or arrange for an online video chat so that your students can see that scientists are real people, not caricatures. I hope these ideas will inspire some of you to try incorporating at least a bit of Hollywood science into your classroom as a way to bridge the gap between school science and students’ everyday lives. Another version of this column was originally published by NSTA. See www.nsta.org/publications/blickonflicks.aspx.